Life casting is a great way to preserve a moment in time; similar, in a way, to a photograph, but fully three dimensional. Life casting sculpture, also known as body casting, is creating a mould from the person, and then reproducing that form in another material. 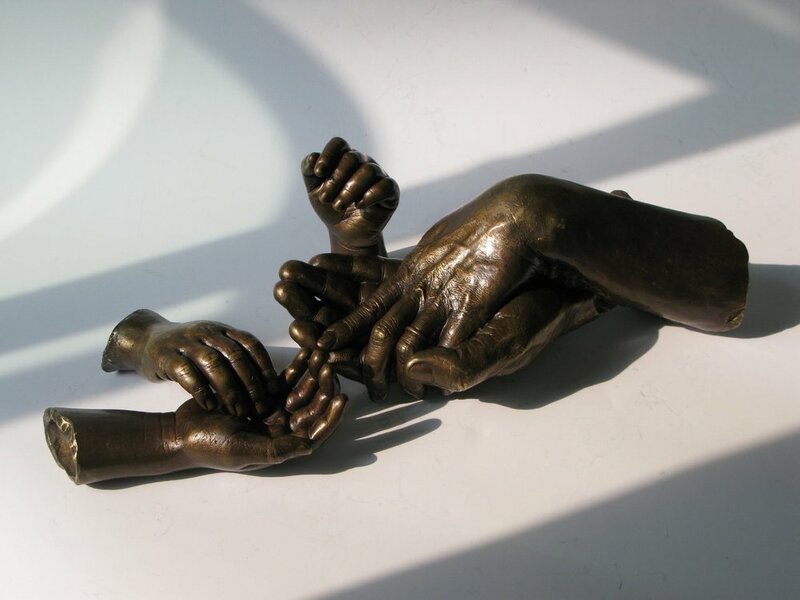 There is a large range of compositions possible in life casting; babies feet and hand casts, face casts, wedding hands cast, mother-to-be's baby bump, even your pet's paw! Popular material options are Sterling Silver, Nickel Silver, Bronze and Plaster. Other metal and non-metal options are available. I can provide artistic directions to suit your needs. The time needed for a basic cast, for example a baby hand, or foot, is usually only few minutes plus a little time for preparation. A more complex composition will take longer. The mould is made from a harmless, non-toxic water-based material that sets in about one and half minutes and is then gently removed. The best results are achieved when your baby is asleep. Some larger moulds; a torso or a baby-bump, require a casing to prevent distortion of the mould, this will increase the time needed and greater co-operation of the model. Please contact us to discuss individual pricing as the variety of materials on offer and the complexity of compositions need to be considered. A Plaster cast can be achieved in a few days, whereas Bronze or Silver casts can take a few months to be completed, depending on the casting schedule at the foundry. Previously produced plaster casts, perhaps when a baby is only a few days old, can be converted to other materials at a later date. Seize precious moments, you can consider materials later, perhaps at the handover over a coffee?